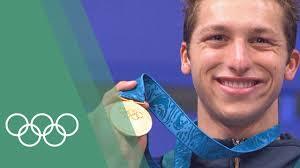 Australian swimmer Ian Thorpe was born today, October 13, in 1982. He won five Olympic gold medals, the most won by any Australian, and with three gold and two silver medals, was the most successful athlete at the 2000 Summer Olympics. At the 2001 World Aquatics Championships, he became the first person to win six gold medals in one World Championship. In total, Thorpe has won eleven World Championship golds, the third-highest number of any swimmer. Thorpe was the first person to have been named World Swimmer of the Year four times by Swimmer's World magazine, and was the Australian Swimmer of the Year from 1999 to 2003. His athletic achievements made him one of Australia's most popular athletes. Shortly after the London Olympics, Thorpe published an autobiography titled, This is Me. The book drew major attention, mainly due to a chapter about depression, which Thorpe continues to live with on a day-to-day basis. In his book, Thorpe also confronted the rumors about homosexuality, listing them as yet another unwarranted pressure that made him feel isolated, not because of his sexuality, but because his honest denials were interpreted as pitiful lies. In a July 2014 TV interview, Thorpe came out as gay. He stated "I'm comfortable saying I'm a gay man. And I don't want people to feel the same way I did. You can grow up, you can be comfortable and you can be gay."